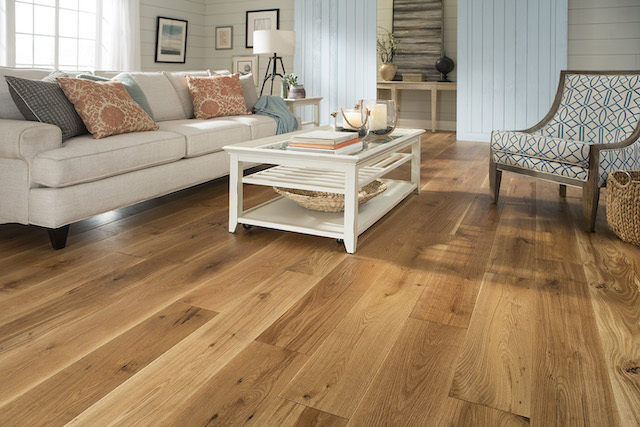 There are so many reasons to choose hardwood flooring, not the least of which is its natural, timeless beauty. While that beauty comes at a price, hardwood adds to the resale value of your home and can be expected to last for decades, if properly maintained. With the growing popularity of less expensive engineered hardwood, more people are enjoying the luxury and beauty of real hardwood flooring. 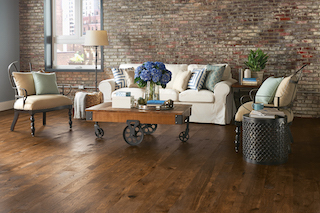 Today’s hardwood floors are tougher and more versatile than ever. 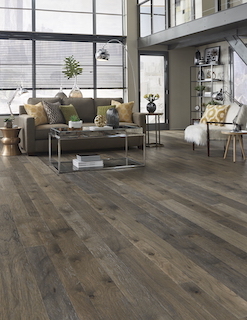 New wear layers make the factory-finished floors you’ll find at most flooring stores and home centers suitable for spaces that were previously off limits – even below grade. And, with many of these new finishes, regular cleaning takes little more than sweeping and/or vacuuming, with occasional use of a professional wood floor cleaning product. Hardwood also offers a number of installation options – glue down, nail down, floating – to suit any need. 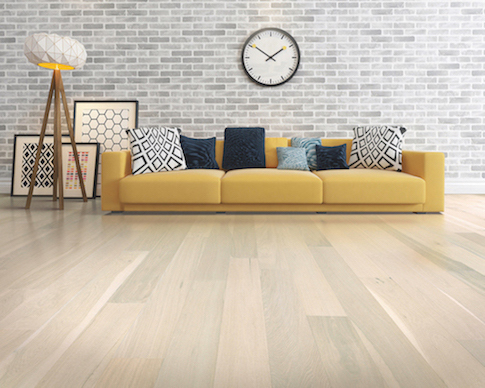 The most popular styles remain the traditional looks that highlight the natural beauty of wood from pale, light stains to more saturated and deeper shades. 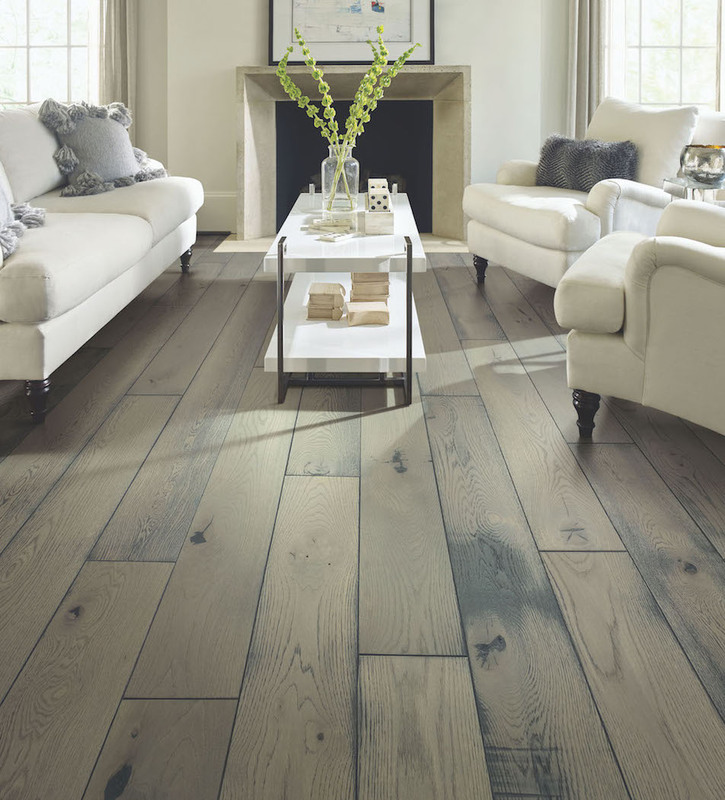 Other popular options: Rough and rustic planks with lots of character (read knots); hand scraped floors with their distinctive “aged” looks; dramatic colors, washes and crackle treatments; and, even textured surfaces. Wider planks or a mix of plank widths create a lot of visual movement and character while advances in milling technology have also lead to longer boards, some as long as 10 feet! At the higher end of the spectrum are reclaimed woods – often from old barns or factories – that are milled to specification. Also at the high end are custom floors that are laser cut to exacting details either to specific designs and patterns from the more traditional to “palatial” style floors. While there are hardwood floors that offer a painted or washed look, there has also been a graying of the color palette that shows up in today’s stains and can be quite sophisticated. You’ll likely see a wider range of color and surface options in hardwood flooring than you dreamed of. That’s why it’s also worth an in-store visit – there’s nothing like seeing it all for yourself.